The Sony Xperia Z4 Tablet packs a 10.1-inch screen of 2,560 x 1,600 pixel resolution which results in a pixel density of 299ppi. The display has no Gorilla Glass protection, instead Sony specifies Chemical tempered glass, broad as that may sound. There's an anti-fingerprint coating in the specsheet as well, but it doesn't do a very good job and the screen gets instantly covered in smudges. Keeping it clean is nigh on impossible, unless you're in the habit of carrying a microfiber cloth in your pocket and enjoy using it. With Sony opting for the stock Lollipop notification shade, there's no readily available Auto brightness switch, you have to delve into the settings. A double-tap-to-wake feature can be enabled, but it doesn't work in the opposite direction and you have to use the power button to send it back to sleep. There's no glove mode. The display comes with the lot of Sony's proprietary features including the Triluminous tech for wider color gamut and the X-reality engine, which enhances images and improves sharpness. If you're unhappy with the default output, you can manually adjust the white balance in settings via RGB sliders. There are no presets, though. The Xperia Z4 Tablet posted admirable results in our display test with high brightness and contrast at the 100% percent setting. At anything other than maximum, the tablet keeps adapting to ambient conditions despite turning off the setting, so we couldn't get a reliable measurement. What's readily noticeable though, is that brightness drops quickly once you start moving the slider to the left. The Xperia Z4 Tablet comes with a 6,000mAh battery, which is the same capacity as the one in the predecessor. 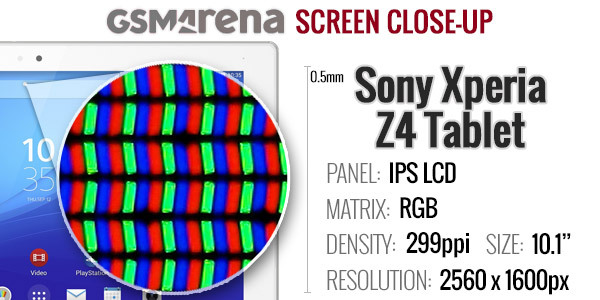 The Xperia Z2 Tablet had a 1,920 x 1,200pixel display though and the new one has about 80% more pixels to keep lit up. 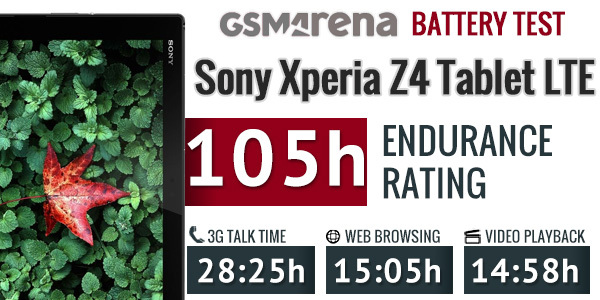 Update June 29:Now that we've gotten our hands on a retail Sony Xperia Z4 Tablet it's time to look at the final battery results. Previously we got 14 and a half hours of video playback which we retested at almost 15 hours on the new unit. The 12 hours of web browsing have increased by 3 hours for a total of 15 hours. We also performed our standard call test and saw the tablet last for 28 and a half hours of constant talking. Combined with the very good stand-by managed by the Sony Xperia Z4 Tablet we arrived at an endurance rating of 105 hours - that's the amount of time you can go on a full charge if you do an hour of calling, video watching and browsing per day. There are two versions of the Sony Xperia Z4 Tablet - Wi-Fi only and Wi-Fi + LTE, and we have the latter. It has quad-band 2G, quad-band 3G connectivity and LTE over no less than 12 bands. The LTE is Cat. 6 which means that speeds up to 300Mbps of downlink and 150Mpbs uplink are possible, at least in theory. Outside LTE coverage, the Z4 Tablet is rated for mobile data speeds of up to 42Mbps HSDPA and 5.76 Mbps HSUPA. If you have the Wi-Fi only version and an Xperia phone with a data plan, you can use Xperia Link to share the phone's internet connection over Bluetooth (which uses less power than a Wi-Fi hotspot). Local connectivity is covered by dual-band Wi-Fi a/b/g/n/ac with DLNA and Wi-Fi Direct, so you can easily share content from your tablet on a DLNA TV or music player. If a media app supports the Throw function (like the video player), you can use it with the Smart Connect app for DLNA functions (sharing screen, etc.). There's also Bluetooth 4.1 which sorts out problems with interference with the LTE radios. It supports a whole bunch of protocols, including A2DP for audio streaming. There is also support for the ultra-low power ANT+ connectivity protocol, which is usually used for connecting to various sports accessories such as heart rate monitors or bicycle speed & cadence meters. The Xperia Z4 Tablet features NFC too, but there's no app to handle the NFC functions out of the box. Luckily, there are plenty of capable NFC apps in the Play Store. There's a GPS receiver as well with A-GPS and GLONASS. microUSB handles charging and PC connectivity. There's USB On-the-go functionality for USB flash drives, mice and keyboards. The port is MHL-enabled too, and supports HDMI connections to an external monitor. If you have a PlayStation 4, you can use the PlayStation app to connect to it and chat with friends, get alerts and notifications, pick and download games for the PS4 from the tablet and even use the tablet as a second screen if the game supports it. The Xperia Z4 Tablet comes with Sony's Smart Connect app. It lets you set your device to do a variety of things, like launch an app or set an alarm, whenever you connect an accessory, e.g. a headset or a charger, or during a time interval (e.g. mute alarms at night). It doesn't work with NFC tags though, which is very disappointing.